This Russian Orthodox Church conducts services on Sundays, but visitors can drop in on other days for a small fee. The onion-domed cathedral was planned in Russia and then constructed in Tokyo by Meiji-period ace architect Josiah Condor in 1891. The dome collapsed in the Great Kanto Earthquake of 1923, but was rebuilt in 1927, this time with a lower belfry and a more Byzantine style. 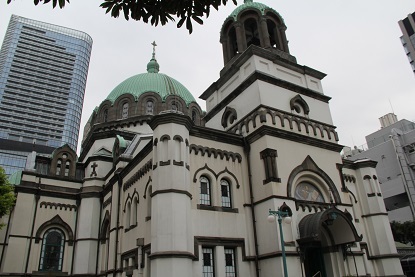 A survivor of World War II, the cathedral lends a unique sight to the Tokyo mosaic of architecture. Inside, the subdued lighting perfectly complements the quiet atmosphere of worship.